"Stalk the forest with your wolf-friend ... foil the five-fingers' traps with your keen senses ... outsmart the trolls ... be a Wolfrider on the World of Two Moons. 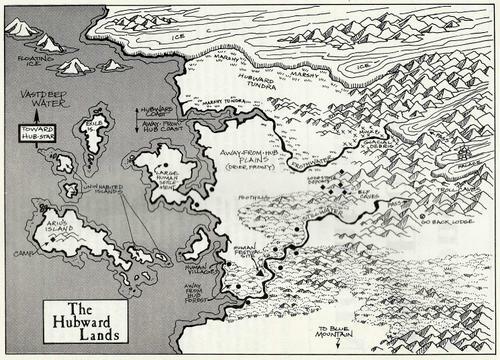 But, the Wolfriders lost their forest Holt to hostile humans, prompting the search for a new home, and other elves. Their story is chronicled in Elfquest, the popular pictorial series. 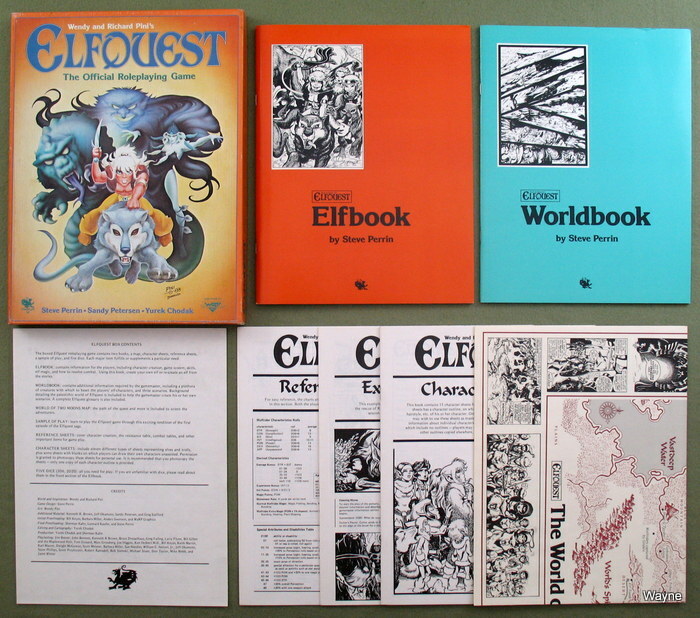 Now you can visit that world through the Elfquest roleplaying game. Immerse yourself in the Wolfriders' saga through characters you create. Replay the stories as they were told, return the Wolfriders to their Holt, or create your own quest. Play members of other tribes, such as the Blue Mountain or Sun Folk elves, or play troll, human, even preserver characters." 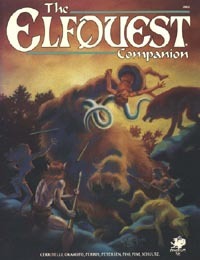 Chaosium released an updated printing of the 1st edition Elfquest box. 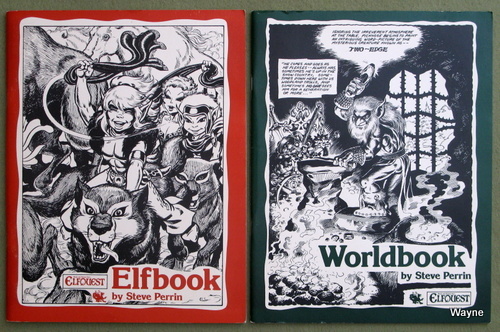 Changes are slight, including altered graphics on the Elfbook and Worldbook. Also Contents sheet is 11"x17" folded into two sheets, Errata on the flip side of the contents, and a Ral Partha ad on the 2nd page (need to verify this with a 1st print). This set had the Fall 1985 Chaosium catalog inside. This later printing seems to be less common than the earlier printing. "Experience the Wonder and Excitement of Elfquest! Stalk the forest with your wolf-brother... foil the cunning plots of the trolls that lurk nearby... be a daring Wolfrider questing for adventure on the mysterious World of Two Moons! Immerse yourself in the Elfquest saga through the characters you create. You and your friends can replay the stories as they were told or embark upon your own thrilling quests. Find your own personal vision of Elfquest. Bring the beauty, the drama, and the action of the stories to life within the world of your own imagination! More than 60 dynamic illustrations by Wendy Pini, many specially created for this book. 12 superb full-page color plates by Wendy Pini, depicting the major Elfquest characters. Detailed, precise information on the World of Two Moons, its inhabitants, ecology, and more." 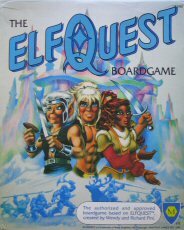 "The Elfquest Campaign expands the scope of the Elfquest game, and provides long hours of game enjoyment. 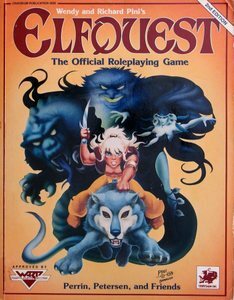 • Errata for Elfquest smooths the flow of the game and adds material from issues 19 and 20 to the game-rules. • Finding an Elf Name explores the origins of elf names and the reasons for which particular names are bestowed upon individual elves. • Help with Elf Design aids players and game-masters to determine appearance and personality for elf characters. • Wolf Ecology on Two Worlds explores the similarities and differences between Earthly wolves and their counterparts from the World of the Two Moons. • The Wolfhaven Holt provides a home for player-character Wolfriders who are not from the stories. • The Dying River is a scenario for Wolfrider characters in which the elves must stop a tribe of trolls from polluting a river and killing the elves' forest. • Fire Flight is a scenario which pits a band of Plainsrunner player-elves against their worst enemy — a prairie fire. • Characters: game statistics for 17 characters from the stories are included." 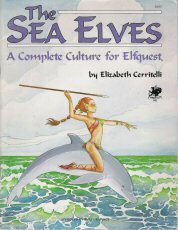 "Soon after their arrival on the islands the Sea Elves allied with the wavedancers, a species similar to Earthly dolphins. The wavedancers taught the elves to fish, and which sea plants were good to eat. Sea Elves and wavedancers still enjoy their alliance, often sharing a bond more similar to that of soulmates than to that of bondmates. The wavedancers allow the Sea Elves to ride on their backs, giving the elves great range, and allowing them to seek larger and better fish on the open sea. Some elves who live on the less fertile islands have become pirates, raiding other, more-fortunate elves for food and essential goods. Sea Elves have learned not to trust strange elves unless the strangers prove themselves to be friendly first. The Sea Elves includes everything needed to play a campaign taking place on the archipelago. 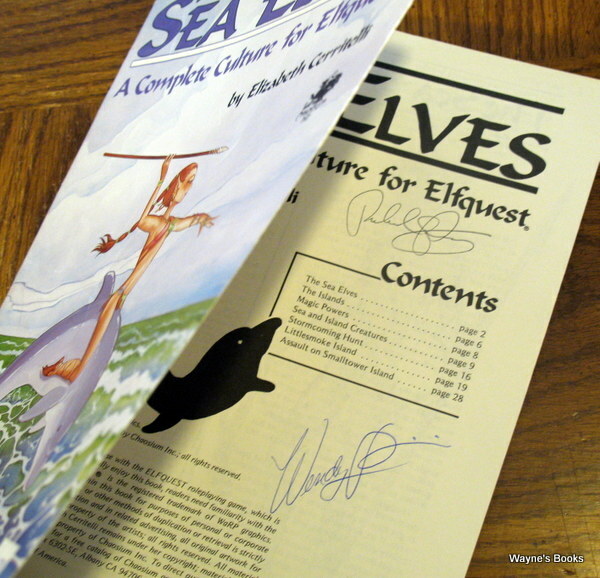 The culture and history of the sea elves is completely described. The island environment of the elves is presented, including rules for volcanoes, earthquakes and Great Waves. The Sea Elves have some magic powers which are possessed by no other tribes; these are also given here. The creatures of the sea and of the archipelago are described, including wavedancers, manyarms, sea snakes, boat-back turtles, manytooths, and skulkers. Island plants are also covered. Three scenarios complete the package. The Stormcoming Hunt brings player-elves on a typical Sea Elf fishing expedition. Littlesmoke Island is a new island discovered by exploring or by lost elves. Assault on Smalltower Island is the story of a raid on a well protected island. Players can portray either the attackers or the defenders, or both." "As more children of the High Ones gather at the Palace, the realization grows that elfin tribes are widespread in the world. Mindful of the successes of Cutter's great quest, it is decided to send out organized parties to explore the World of Two Moons. You and your friends are selected to be explorers, and your party feels eager to participate in such a glorious undertaking. You equip yourselves and wait for the weather to warm. From the Palace you stare Hubward, toward which you will soon travel. There, across the icy plains, a great range of mountains rises. What wonders lay beyond them, and what dangers? Perhaps you can help embattled tribes to safety; perhaps you can reunite hitherto unknown elfin tribes with their rightful heritage and with others of their kind; perhaps when you return you will be as honoured as Cutter himself. Elf War is a pair of linkable adventures for Elfquest set in the cool valleys and beside the icy waters of the Hubward wilderness. The 'Elf War' adventure is the shorter, playable in 1-2 sessions. 'Beyond The Frozen Mountains' is a multi-session adventure, to be extended or condensed as the gamemaster desires. Relevant character statistics accompany both parts." 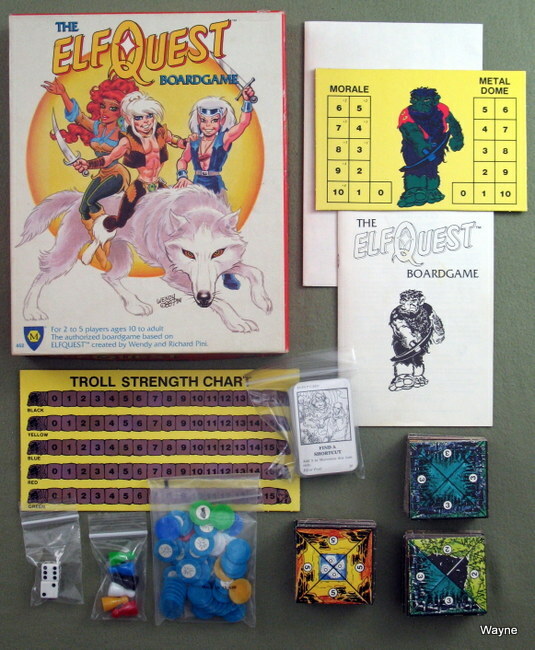 "The ELFQUEST Boardgame includes: • Rules for Introductory and Basic Games • Game board surface sheet • 49 square tiles • Four color pawns • two six-sided dice • Five Clue counters • Troll Strength Chart • Deck of 56 cards • 52 Elf Strength Counters • Twelve counters for the Troll Player"
"Go in search of Elf Home in this exciting game based on Wendy and Richard Pini's classic series. Build the board as you lead your Elf Tribe toward safe passage. But, you must work quickly before the Troll completes the Metal Dome, sealing off the Haven forever. Elfquest is fast-paced, exciting, challenging, easy to learn, but impossible to predict."